For Simon and his family, December 25 was not the joyful celebration of Jesus’ birth they had hoped for. On this fateful night Simon and his family witnessed an outbreak of war in the world’s newest country. Help South Sudanese RefugeesSimon, a teacher working with a Samaritan’s Purse literacy program, was captured by rebel fighters outside his house in Jonglei State, South Sudan. The rebels forced him to the ground. When they tried to make their way into his house Simon used the moment of distraction to get away. After escaping the rebels, Simon was able to find his family as well as his brothers’ wives and children. Taking what little they could carry, they set out that night to try and find safe haven. SCORCHED EARTH: Despite their difficult conditions, South Sudanese refugees in northern Uganda have hope that God will restore them. HELPING VICTIMS OF CONFLICT: Samaritan’s Purse is meeting critical needs and provide life-saving relief in South Sudan. Traveling on foot in rough terrain with a limited food supply and other basic needs, it took days to reach the border with Uganda. They were taken to a transit center for refugees. One month after leaving their home, Simon and his family were relocated to a refugee settlement in Kiryandongo District in Uganda. They received a piece of land with help from the United Nations High Commissioner for Refugees (UNHCR) and the Uganda Office of the Prime Minister (OPM). He does not know if his brothers are still alive, but is doing his best to help care for their wives and children. Samaritan’s Purse is working in the settlement, partnering with the World Food Programme to provide food rations for the refugees. Samaritan’s Purse staff from our office in Uganda are meeting the needs of refugees from South Sudan. The food provides vital nutrition and bridges the gap until they can either begin to take care of themselves or return home. But going back home seems impossible at this point. Reports coming out of South Sudan indicate both sides in the conflict are violating a January ceasefire. More than 850,000 people have been forced to flee the violence. Many are heading to Uganda. 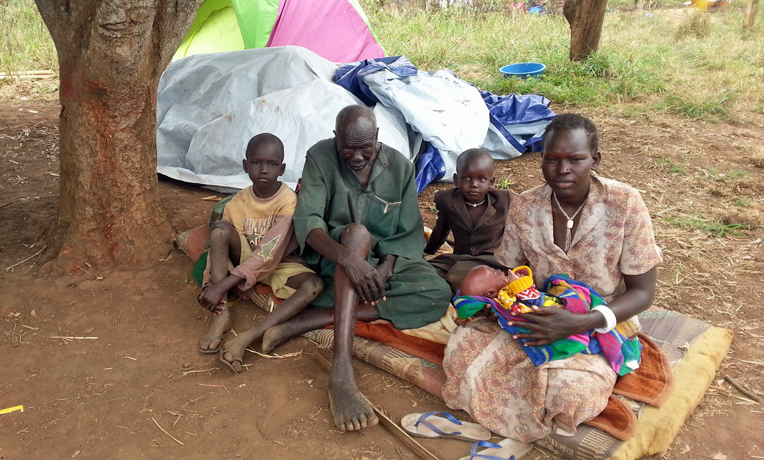 Simon and his family are among an estimated 10,000 refugees that will be registered in the Kiryandongo resettlement by the end of the week. In this difficult situation, Simon said Samaritan’s Purse is a blessing. He said coming to this settlement in Uganda was purely God’s work. 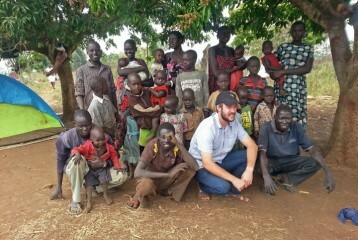 It was a reunion with the Samaritan’s Purse family that he had first known in South Sudan. And being resettled in Kiryandongo, a peaceful place with access to services, was yet another way of God sharing His love to the disadvantaged people of South Sudan. Please pray for the hundreds of thousands of South Sudanese people displaced by the violence, and for Samaritan’s Purse as we meet basis needs in the Name of Christ. Feed A Family God has positioned Samaritan’s Purse to feed hundreds of thousands of people in Africa or elsewhere who are on the brink of starvation because of drought or war. For $35 per family, we can deliver a month’s supply of sorghum, lentils, or other staples in the Name of Jesus Christ.